Sir William Lawrence Bragg was a crystallographer. His studies established the relationship between the wavelength x-rays on the crystal structure. He and his father William Henry Bragg were awarded the 1915 Nobel Prize in Physics "for their services in the analysis of crystal structure by means of X-rays." March 31, 1890Birth, Adelaide (S.A.). 1908Obtained first-class honours degree in mathematics, Adelaide University, Adelaide (S.A.). 1912Obtained first-class honours degree in Natural Science Tripos, Trinity College, Cambridge (England). 1914Awarded Bernard Medal, United States Academy of Sciences. 1914 – 1915Fellow and Lecturer in Natural Science, Trinity College, Cambridge (England). 1915Awarded Nobel Prize in Physics along with his father Henry William Bragg "for their services in the analysis of crystal structure by means of X-rays". 1915 – 1919Technical Adviser on Sound Ranging, Map Section, G.H.Q., France. 1918Awarded Officer of the Most Excellent Order of the British Empire. 1919 – 1937Langworthy Professor of Physics, Manchester University, Manchester (England). 1931Awarded Hughes Medal, Royal Society. 1934Co-wrote "The Crystalline State" with father William Henry Bragg. 1936Co-wrote "Electricity" with father William Henry Bragg. 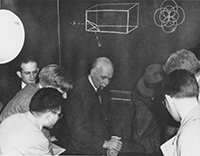 1937Co-wrote "Atomic Structure of Minerals" with father William Henry Bragg. 1937 – 1938Director, National Physical Laboratory, London (England). 1938 – 1953Cavendish Professor of Experimental Physics, Cambridge University, Cambridge (England). 1946Awarded Royal Medal, Royal Society. 1948Awarded Roebling Medal, Mineralogical Society of America. 1954 – 1956Director, Royal Institution of London, London (England). 1958 – 1960Chairman, Frequency Advisory Committee. July 1, 1971Death, Ipswich (England). Father. PhD advisor at University of Leeds and awarded 1915 Nobel Prize in Physics with son William Lawrence Bragg. Advised by Bragg at University of Cambridge. Advised by Bragg at University of Manchester. Post doctorally advised by Bragg at University of Manchester. Post doctorally advised by Bragg at University of Cambridge. Advised by Bragg at Cavendish Laboratory, University of Cambridge. National Physical Laboratory (Great Britain). Obtained first-class honours degree in Natural Science Tripos (1912). Fellow and Lecturer in Natural Science. Fellow and awarded 1931 Hughes Medal and 1946 Royal Medal. Obtained first-class honours degree in Mathematics (1908). History of protein analysis [sound recording]: delivered at the American Crystallographic Association meeting, 1967. Oral history interview with Sir William Lawrence Bragg, 1970. Ernest Merritt early American Physical Society movies [video recording], 1930-1934. J. Craig Venter Institute history of molecular biology collection, 1909-2000. Lawrence Bragg Nobel Prize biography.